This week, I am being a bit more structured with our meals - which means EVERY meal is planned out for us. I've shopped, prepped, and cooked; we are ready for the 1 Week Food Fix. I am so excited to partner with Christy (aka The Tiny Little Chef) and focus on healthy eating. I make working out a habit most days of the week, but I often fail with nutrition. Mama likes queso, margaritas, chips, and salsa. A lot. Focusing on nutrition has been a goal for me for quite a while. However, when the mom life (or life is general) gets stressful, I make bad choices. Everything in moderation should be a motto for all of us to follow because that's what life allows. We are social, and food is often the center of our get togethers, and I LOVE that. But, I need to focus on better choices the majority of the time - for me and my family. 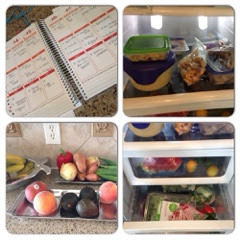 My food prep and calendar for the week - I even made fresh hummus, and it's delish! Thanks, Christy! Are eating and nutrition your downfall? Are you not sure how much to eat? When to eat it? How to pair your foods together? Are you looking to kickstart your metabolism, and reduce the toxins in your body? Would you like to lose the bloating and fatigue? Look no further! I have designed a 1 week food roadmap for you, with no stone left unturned. After working with many Nutrition clients, I have created this very specific, 1 Week Food Fix™. Many of my clients have done my 2, 4, and 6 week meal plans, but I found that most people wanted, and needed, a foolproof 1 week weight loss kickstart. I will tell you what to eat, 5 times a day, for 7 days. I will teach you new, healthy, delicious, Chef created recipes, and I will help you set a foundation for healthy eating for the rest of your life. What does the 1 Week Food Fix™ Include? BONUS: In addition, you will also receive Tiny Little Chef's Clean Eating Grocery List, to help guide you after you have finished the program. What can you expect from the 1 Week Food Fix™? An elimination of excess water weight. Reduction of sugar, and processed food, cravings. Better understanding of what, and how much you should be eating to fuel your body for weight loss, and more! Please visit www.tinylittlechef.com/store to purchase your copy, and remember to please select my name from the drop down menu at checkout. I can't wait to see how I feel after these 7 days. If you have questions, please visit Christy's site or send me a note. If you join us, you will be added to a support group of some awesome folks. See where I'm linking up this week :) Click HERE.